Aviation Updates Philippines - National flag carrier, Philippine Airlines, will be Pope Francis' official carrier for his four-day visit in the Philippines on January 15 to 19, 2015. Philippine Airlines already cancelled all flights to and from Tacloban on January 17, 2015 as the Civil Aviation Authority of the Philippines closed the Daniel Z. Romualdez Airport for security reasons. According to a statement, Philippine Airlines will fly Pope Francis from Manila to Tacloban on January 17 utilizing an Airbus A320-200. In Tacloban, the Pope will have a lunch with the families of the victims of Super typhoon Yolanda, or known internationally as Typhoon Haiyan. As the Pope arrives at the Ninoy Aquino International Airport at January 15, it will proceed to the Malacañang palace for a courtesy visit to the Philippine President, Benigno Aquino III. Alitalia, the national airline of Italy, will carry Pope Francis to Manila. However, Philippine Airlines will fly the Holy Father directly to Rome from the Ninoy Aquino International Airport. This is not the first time that Philippine Airlines will roll its red carpet for the Pope as it also flew Saint John Paul II during his Papal visit in the Philippines in 1981 and 1995. 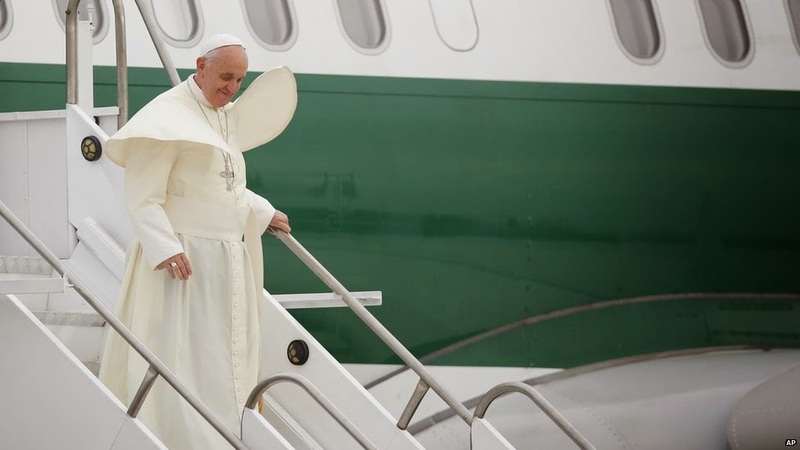 The aircraft that will be utilized for the Papal flight is usually being fitted with First Class in the front rows for the Pope and his closest cardinals, and the rest of the seats for the media, according to PFN. During Saint John Paul II's visit in the Philippines, a special papal chamber was fitted in the DC-10 aircraft that flew him to Guam and Haneda after his visit. As part of the preparation for the Papal visit, the Civil Aviation Authority of the Philippines has issued a no-fly zone from the Luneta Grandstand to Baclaran area for security reasons, according to retired Gen. Rodate Joya, Deputy Director General for Operations of CAAP. “This is to ensure that the Pope is safe from any threat,” Joya said in a report.